One Day A Rain Is Going To Come. As more flash flooding caught the city unawares this morning, we took out our unsteadi-cam while walking the dog and captured some of the flood waters hurtling through Griffith Park. The Tolka river is usually as quiet as a mouse but when heavy rains come, it turns into something out of a white water rafting adventure brochure. 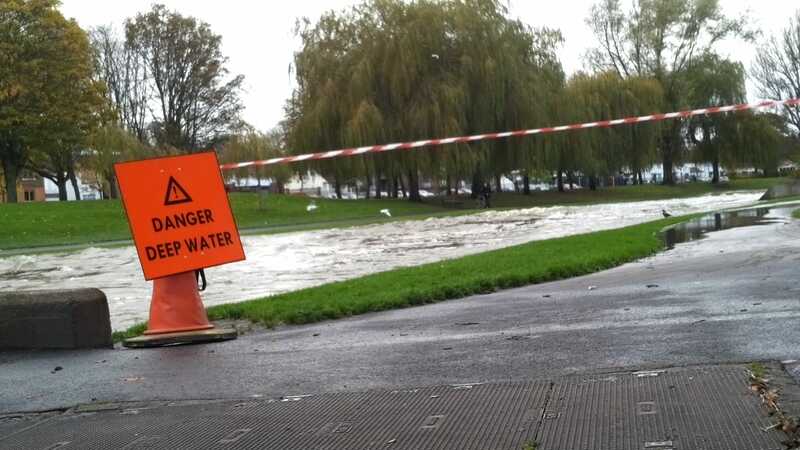 Back in 2002 the Shelbourne Soccer Club saw extensive damage to its Tolka Park ground, with areas of the stadium going eight feet under water – not to mention the mountains of damage caused to residential units all over the area. Alleviation works on the river were planned since 2001, but were fast tracked after bad flooding in 2002. The Office of Public Works recently reached out to the orts for any ideas our creative communities might have for sand banking the bulging banks. So, any of your areas blighted with flooding these past few days? How are defences holding up? Let us know. People in Finglas have no sense of conserving a valuable commodity.